The red heart metal tin has a 2 pieces structure and on the lid there is a glittering fake diamond glued onto the metal heart tin lid which make this heart tin standing out and attracting attention of the buyers who pays a glance at it. The mini heart tin has a metalic golden lining around the 2 small hearts which make this tin box much more easier for customers to know this heart box is made of metal thing! This seamless heart tin base make this box possible for candle and cosmetic packaging as this tin is designed with anti-leakage function! 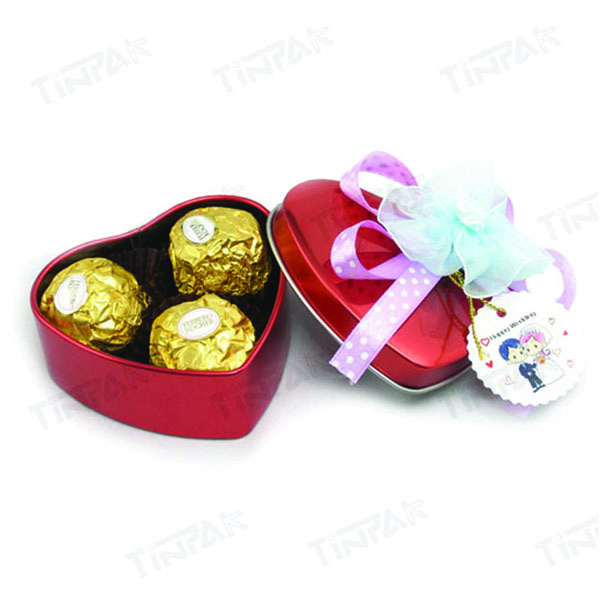 Tinpak is a tin box factory with over 35 existing heart tin tools which could be widely used for candy, chocolate, candle, wine and even CD packaging. We can make any shapes of heart tin boxes with your drawing or samples. 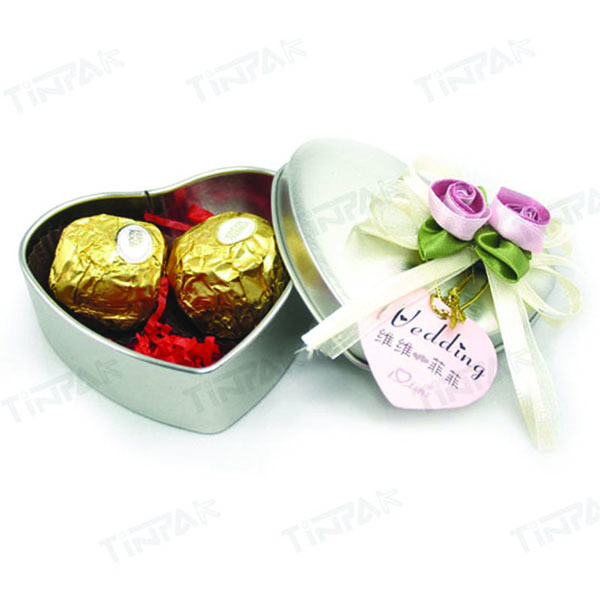 Tinpak can provide solutions to make your heart tin packaing more attractive with diamonds, 3-D embossing, special varnish. In addition, we can supply clients with food grate APET trays, foam pads to be filled inside the heart tin base. Tinpak takes responsibility of supplying cilents with hygien heart tins as our trained workers with good health knows exactly how to handle final packing and quality control for food packaging heart tin boxes. As a 10 year export experienced heart tin box factory, we can produce the the heart tin containers according to Eropean and Ameraican standards with factory prices. Dongguan Tinpak specializes in tooling, printing, manufacturing and marketing full range of decorative tin boxes, such as DVD tins, Chocolate tins, Tea tins, Christmas tin boxes, Mint tins, Candy tin boxes, gift tin boxes, etc. As Tinpak has been offering global clients with high quality products, competitive offers as well as satisfactory services, we have established good partnership with hundreds of clients in Europe, America and Oceania for the supply of decorative tin boxes. This mint heart shaped tin box is a good choice for promoting. It has cute size and good looking. 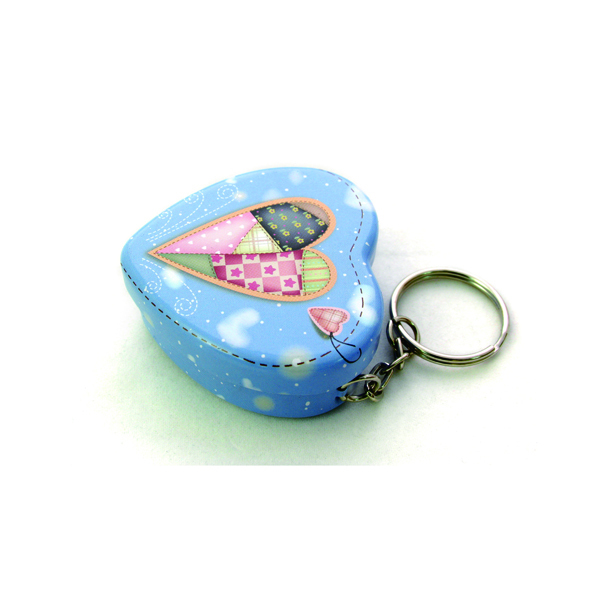 Tinpak can make the cute heart tin box with key chain as well.